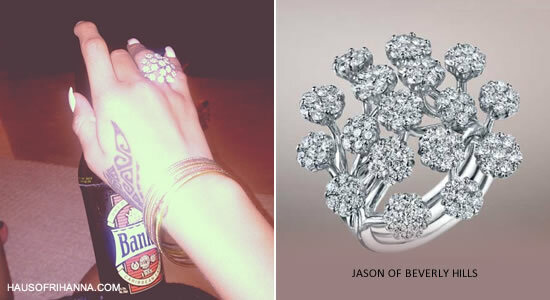 Fans have been admiring a stunning diamond ring that Rihanna has been wearing lately. A few days ago Rih posted this pic of her “liming”, as we Bajans like to say, with a cold Banks beer and the ring in full view. The Diamond Cluster ring comes from one of her favourite jewellers, Jason of Beverly Hills, and is made of white gold.